Take a step back into the wild west on this guided, 3-hour walking tour. 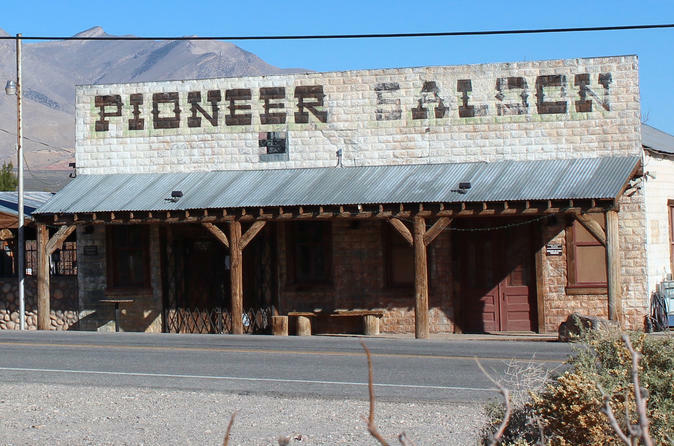 Visit attractions like the Pioneer Saloon, the Ghost Town Cafe, the Museum, the Time Capsule, the Centennial Wall, and the town of Goodsprings, Nevada. Discover the history of this once-booming town that was larger then Las Vegas just 100 years ago. Take a journey back 100 years and discover the town of Goodsprings, Nevada, home to the world-renowned Pioneer Saloon and the Ghost Town Café. Both buildings are made out of pressed tin and were ordered through the Sears and Roebuck Catalog back in 1913. There are many antiques and historical artifacts surrounding the 2.5-acre lot, none more so than the Brunswick bar that was built in the 1850's by Brunswick. The town of Goodsprings was bigger than Las Vegas. If you lived in Sin City then, you would have traveled to Goodsprings for any and all entertainment needs. In 1916, Goodsprings was home to seven bars, six mercantile stores, four brothels, the Fayle Hotel, an ice cream parlor, retail stores, a newspaper, a Ford dealership, and a repair shop. The main road to California went through Goodsprings back then. Sit at the same bar that Hollywood legend Clark Gable sat at while waiting for news on his beloved Carole Lombard. See the mountain that her plane unfortunately crashed into which killed her, along with 21 other people. Spend time in the Museum room reading 100-year-old newspapers of Goodsprings and how excited everyone was for the upcoming ball at the Fayle Hotel. Check out the Centennial Wall, the Time Capsule, and 'Fallout New Vegas' buildings/people/homes. All tours are professionally guided with pickups from Las Vegas hotels to the Pioneer Saloon and back. A meal and refreshments are included in the tour price. Please dress appropriately for the weather conditions. Goodsprings is typically 10 degrees cooler than Las Vegas. Enjoy live music most days, televisions that play some shows that the property has been featured on, and a short walking tour around the old ghost town.